ThunderEggs: Regretfully archiving this cache since there's been no word from the owner in the weeks since the last reviewer note was posted. If the owner wants to re-activate the cache, please contact a volunteer geocaching.com reviewer to see if that's possible. 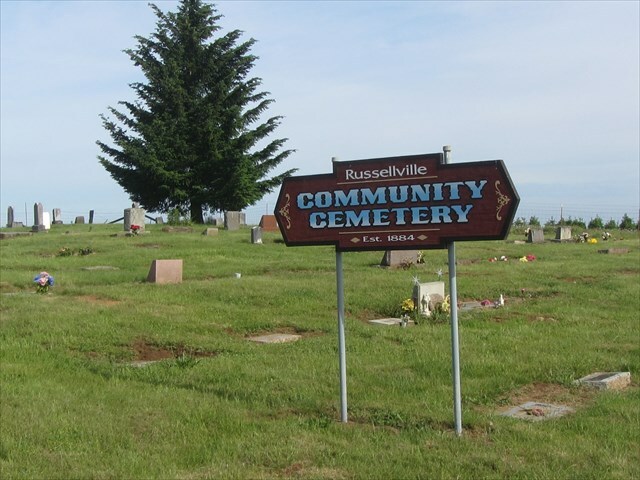 ABOUT THIS CACHE: This cache is placed near the entrance gate to the Russellville Community Cemetery on Sawtell Road in Clackamas County, Oregon. There are currently approximately 113 internments in this cemetery, including John and Phebe (Ingels) Wilhoit, who founded the Wilhoit Mineral Springs nearby (now Wilhoit Mineral Springs County Park). ABOUT THIS CEMETERY: This cemetery was established in 1884, and it includes over 100 graves, including pioneers John and Phebe Wilhoit, who are listed on the Oregon State "Early Oregonians" list. JOHN WILHOIT was born 19 Oct 1815 in Madison, Kentucky to Moses and Nancy (Douglas) Wilhoit. John died 18 Aug 1896 in Clackamas County, OR. PHEBE (INGELS) WILHOIT was born 23 May 1818 in Meigs County, Ohio to Joseph and Nancy (Crooks) Ingels. She died 16 Nov 1888, Clackamas County, OR. 1939 John and Phebe Married in Madison, Indiana and birth of Harriett M Wilhoit in 1839 in Indiana. 1888 Phebe died, leaving John a widow. Wilhoit Springs changed hands in 1955 when they were purchased by Al and Mabel Schoenborn, and eventually ownership changed hands again, acquired by Clackamas County and converted into a park. Haqre fznyy cvyr bs ebpxf arne ynetr obhyqre. TWIGMEISTER found this cache first! !